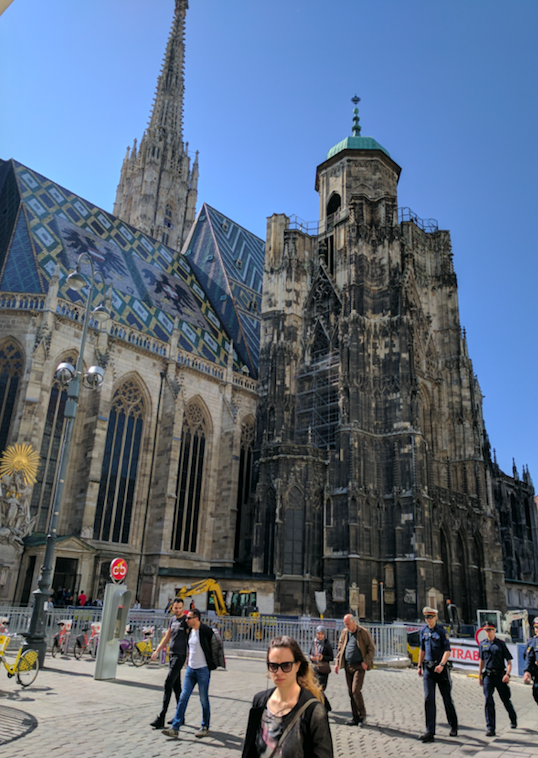 Had a great post-Basel trip to Vienna and Prague. For this "ugly-American", it was enough to convert me. If it weren't for immigration and family issues, I'd move to either city happily. Friendly people, an appreciation for food lacking in the US, history at every turn. Eye-opening. Visited the Boutiques in both cities. 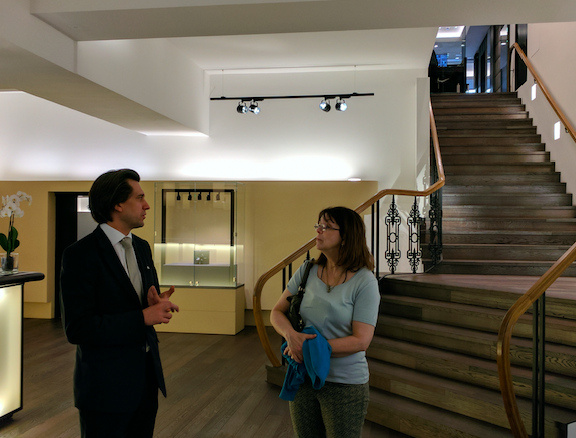 The staff at both were great showing me their facility and a couple of watches I hadn't seen before. 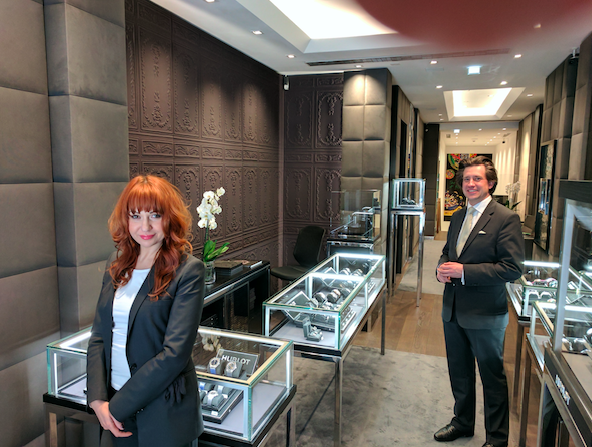 The Boutique is an extension of Wagner's Jewelers. 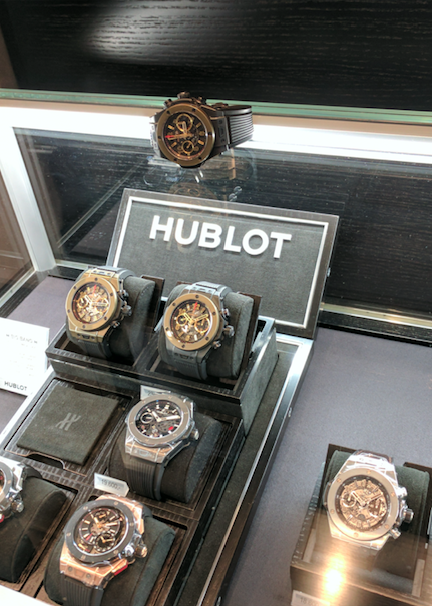 They have 2 regular old jewelry stores in this main Vienna shopping district each showing a limited number of Hublots. Apparently, they've been successful enough to merit their own self-contained facility not far from one of their locations. Downstairs is a large space for events and, in due course I'm sure, more display cases. That's the manager, Tobias Triffterer, with my wife. She's very appreciative of my invite to Basel, 'cause she got to go to Vienna and Prague. I got the bonus of seeing her being interested in the Boutique rather than simply indulging me. Finally, my watch standing guard over the display case that contained it's twin and several others. That's the Full Magic Gold LE on the left if anyone is having trouble finding it. Of course I visited many of the city's highlights. 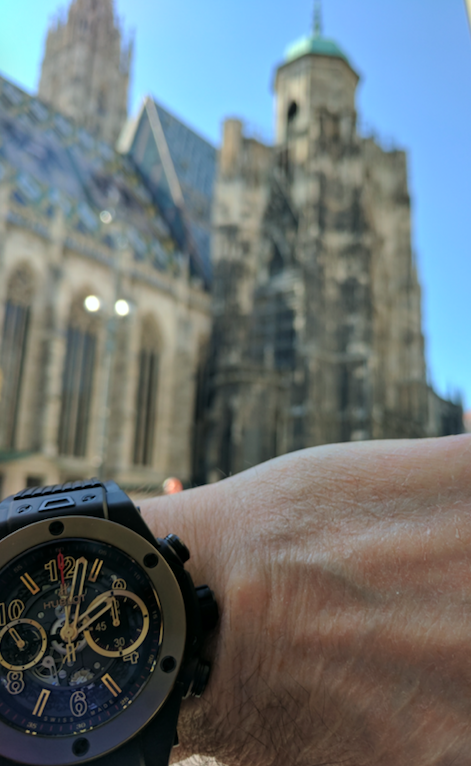 But for the purposes of this discussion I included a shot of my watch at one of the landmarks, St Stephens Cathedral. 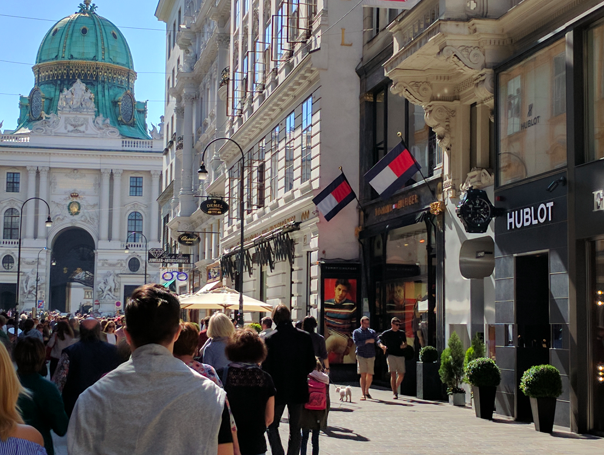 It's right in the middle of the Innerstadt shopping district surrounded by the new and the old. Construction was begun in the 1100's but the original church burned down in the next century. A replacement was put up several years later. This structure was expanded in several steps through the mid-1400's leaving us with the building as it stands today. The roof, however, was replaced in 1945. No, it wasn't the Nazi's. Looters set fires to buildings around the church as the Soviets advanced and embers carried the fire.